If you didn’t catch Apple’s big event this morning, well the full video coverage is now available online in Â low, medium and hi res. Go ahead fanboys, check it out and relive the moments again if you’ve already watched it live somewhere. 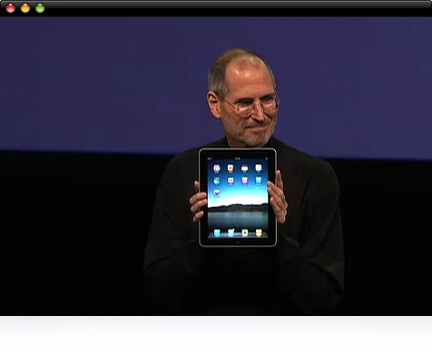 Take a gander at how Steve has unveiled Apple’s latest product. How did he refer to the iPad again? – “a magical and revolutionary device at an unbelievable price” and ” The best way to experience web, email, photos and video.” I’m pretty sure none of us will agree to those two statements. But hey, it’s a marketing campaign, so what can you expect? What? You’re not impressed? How about full support for existing iPhone/iPod apps? iTunes connectivity and media management? Or perhaps its best feature (IMHO) – the iBooks application. It will allow you to purchase e-books from various major publishers and read them of course on the iPad. Alright, alright. You are probably not impressed. Â Just be contented with the fact that Steve has just Â given us big boys a new toy to play with until we grow tired of Â it. Before I forget, here are the links to the videos of this morning’s Apple Event. Enjoy!